Veritas provides academic instruction in a condensed day format in which lessons and instruction in core academic subjects (e.g. reading, penmanship, grammar, math, science, history, literature, and Latin) are provided during a shortened school day. The condensed day format efficiently uses classroom time during school hours, enables parental involvement in the student’s education and maximizes the family’s role in shaping the child’s faith and character. Mornings are taken up with academic classroom work, which is pursued with the utmost diligence. This includes mathematics, language arts, Latin, history, and science. Afternoons are devoted to home-based academic work, requiring involvement of parents. 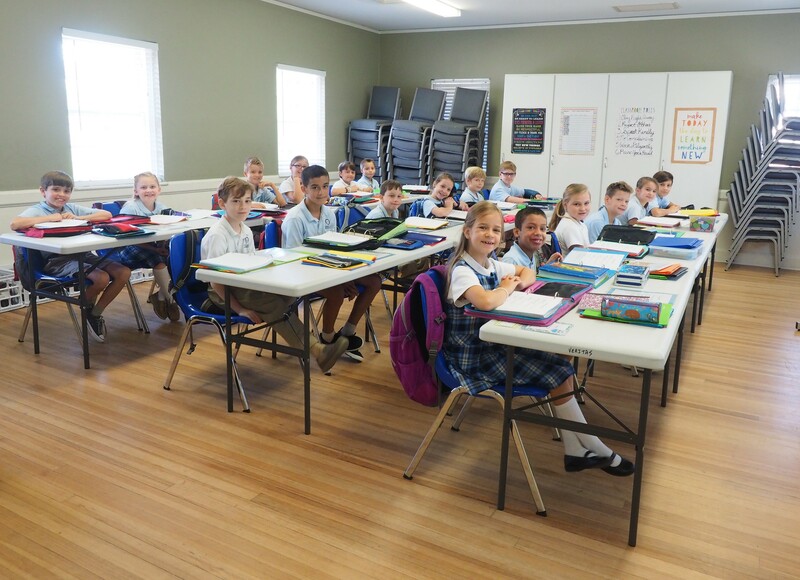 While Veritas provides the bulk of academic instruction in the classroom and does not expect parents to teach formal lessons at home, Veritas does desire parents to be involved in their child’s education. Parental engagement in the afternoons will vary depending on the age of the student (more for younger and less for older students), ability of the student, and nature of the assignment. Veritas provides a significant list of books that are to be read at home. It is our intention that every family set aside a daily “quiet” time devoted exclusively to reading. Our expectation is that since students are not spending a full day sitting in a classroom, then more time may be committed to reading, homework, and other educational activities. Elective courses in art, music, drama, and physical fitness are also made available in the afternoons at Veritas Academy. Late afternoons and evenings are free for family-based activities and enrichment pursuits. Music lessons, athletics, ballet, civic clubs, and other such activities may be enjoyed more than might otherwise be possible. Thus, we combine the substantive academics of classical education with the family-engagement emphasized by home-educators. Grammar – Grades K-6: During the Grammar phase, when children are particularly adept at memorization, we challenge them by providing substantial subject matter for them to memorize. Each subject has its own grammar. In science, children memorize facts about nature. In math, children memorize times tables. In Latin, teachers emphasize vocabulary. Throughout each year in Grammar School, Veritas students learn the factual foundation of each subject. We use songs, chants, and rhymes to help children enjoy the learning experience. Logic – Grades 7-8: The Logic phase involves ordering facts into organized statements and arguments. During these middle school years, when students are beginning to think independently and often develop a propensity for argument, Veritas teaches students to argue well and reason clearly. The study of formal logic helps students understand the fundamentals of a good argument. Practice in making written and oral arguments in all subjects helps to further develop these skills. Again, each subject has its own logic. In science, we use the development and testing of the hypothesis. In math, we develop a student's ability to logically orient numbers through the more abstract concepts of algebra and geometry. Rhetoric – Grades 9-12: Rhetoric is the art of communicating well. Once a Veritas student has obtained a knowledge of the facts (grammar) and developed the skills necessary to arrange those facts into arguments (logic), he develops the skill of communicating those arguments to others (rhetoric). During the high school years, students become concerned with expressions, articulation, and creativity. Classical education helps students develop their minds to think and articulate concepts to others. Writing papers, researching, and orating ideas are skills required in all subjects. Veritas leverages these skills through the final requirement of the defense of a senior thesis. While each component has a primary focus during a particular phase, all skills are developed during all levels. A second grader will develop certain skills in logic and rhetoric. A high school student will still acquire extensive grammar level knowledge in specific subjects (e.g. chemistry). Emphasis is simply placed on different phases during different ages. Lead and serve their family, church, community, and nation with humility, gratitude, and grace.